The Subaru XV already has the lowest center of gravity in the compact crossover class, the highest ground clearance and it’s stable off-road. Subaru says they have made upgrades to all-wheel-drive vehicle’s suspension that will result in a smoother, more compliant ride. For the 2016 Subaru XV Crosstrek, Subaru says their main focus for upgrades to the chassis was to improve the car’s ride quality and reduce the intrusion of noise, vibration and harshness (NVH) into the cabin. Engineers at Fuji Heavy industries (FHI) retuned the front and rear suspension by lowering the pitch rate of the dampers and the coil springs get new settings. Subaru says this will improve ride quality by suppressing the transfer of vibrations into the cabin and the changes will further reduce roll for greater cornering stability. The new spring rate settings should improve stability under cornering by ensuring greater tire contact with the road, while allowing for greater flexibility in ride over rough road surfaces. Subaru also changed the steering ratio on XV and the 2016 model will be 10 percent quicker than before. This will improve the small crossovers steering response and provide more linear, direct and stable handling characteristics, requiring only 2.8 turns, lock-to-lock. The XV’s front cross-member has also been stiffened to improve steering stability. 2016 XV also gets a quieter cabin from extra sound-absorbent material throughout the crossover and from the adoption of new under-bonnet insulators. This cuts vibrations from the engine and reduces wind and road noise in the cabin. The XV’s under-body cover has also been reshaped to reduce wind noise around the rear of the car, while thicker glass for the front side windows and front quarter lights further reduces wind noise around the A-and B-pillars. Subaru says the new XV’s cabin is now 1dB quieter under acceleration or when traveling at high speed. 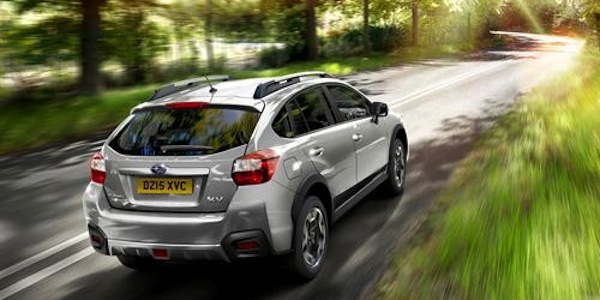 The upgraded 2016 Subaru XV Crosstrek goes on sale in the UK this month. In spite of all the chassis upgrades, Subaru was able to keep its existing on-the-road price, with the range starting from 21,995 British Pounds. There were also upgrades made to the XV’s interior and infotainment. Get the full report here. Still waiting for them to put a bigger engine in this vehicle. As is, it is sluggish. A few more horses and an optional Harman Kardon premium sound system would be greatly appreciated. Very interesting and encouraging news about upgrades to crosstrek. Did these chassis and sound proofing upgrades come only to cars built for the UK, or were they for the cars built for US market also. The article references Subaru UK, and I called Subaru of America thinking they would know. The person I talked with did not know, but indicated changes could be made for UK market specifically. Seems odd that Subaru would not upgrade all products. Do you have any information on this specific? Thank you! Really enjoyed testing the vehicle, except it has zero engine performance, flat acceleration will never make it across a busy intersection. Needs more torque more compression. Along with about 200 horsepower maybe 190 ft lbs of torque.